These Easy Chocolate Chip Cookies are a tweak to the classic recipe, but with fewer ingredients making the recipe simple and quick to put together. 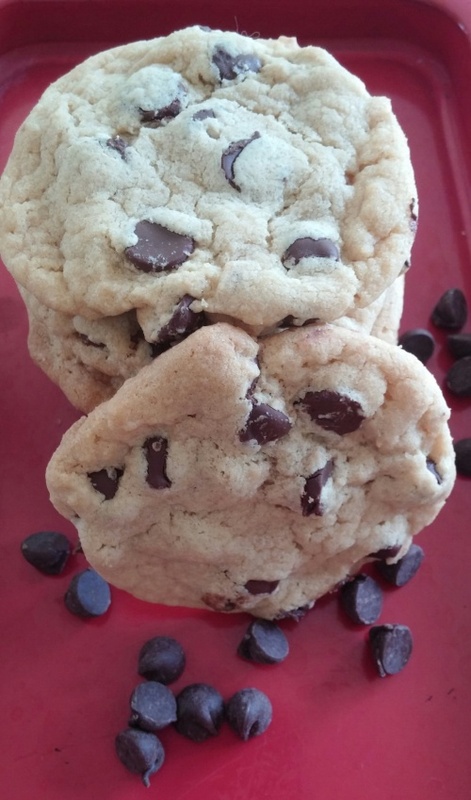 It surprises many people to know that you don’t absolutely need to add vanilla, salt, baking powder – or for that matter, baking soda – to the cookie dough in order to make great chocolate chip cookies. Having said that, The Elf’s version of this stripped-down recipe calls for baking soda, mainly so that the cookie surfaces have bends and crinkles on top. If you’re in a hurry or if you’re a minimalist, you can simplify the recipe even further to just 5 ingredients if you eliminate the baking soda and substitute the all-purpose flour with self-rising flour … or simply eliminate the baking soda altogether and let six ingredients become just five. Two cups of chocolate chips may seem like a lot for a simple chocolate chip cookie recipe, but no one says this version should taste simple. Wait until you bite into the result. Preheat oven to 350º F. Line baking sheets with parchment paper. Measure and mix together the flour and baking soda. Mix the dry ingredients into creamed mixture in two iadditions, combining until well blended. Do not over beat. Add chocolate chips to the dough. Use an ice cream scoop or cookie scoop to drop rounded teaspoonfuls onto the prepared baking trays, 2 inches apart. Bake 10-12 minutes until cookies are lightly brown around the edges. Remove cookie sheets from the oven. Allow cookies to sit for 5 minutes before using a spatula to transfer them to a wire rack. Cool completely. Allow butter or margarine to soften to room temperature at least one hour before mixing. Softened butter creams more smoothly and evenly with sugar. Be sure to use brown sugar (either light or dark) rather than granulated sugar in this recipe. The molasses in brown sugar gives the dough a softer, moister texture than granulated sugar.